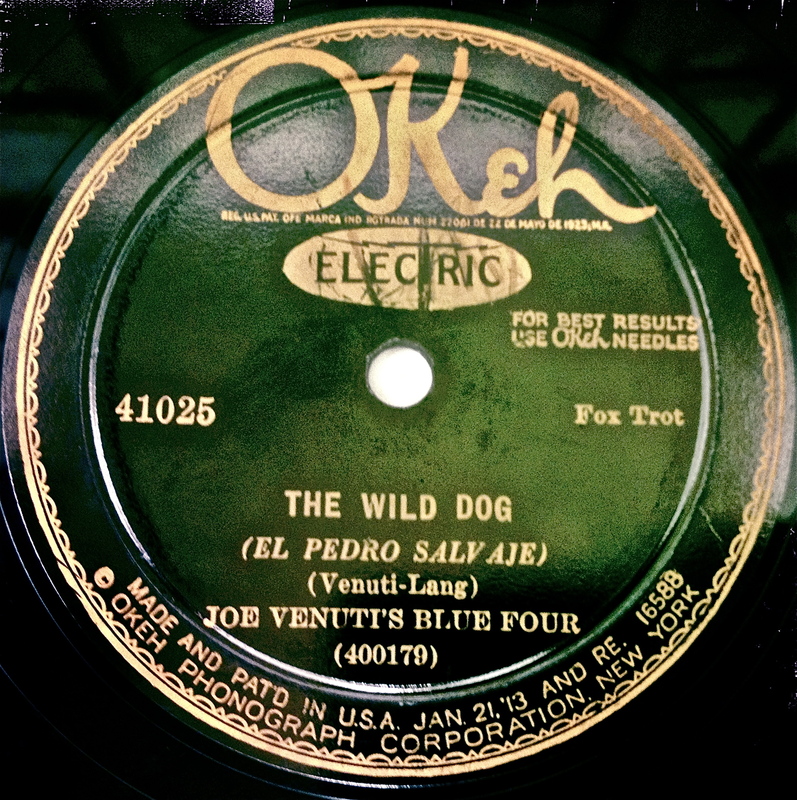 78: “The Wild Dog” b/w “Dinah” by Joe Venuti’s Blue Four. Okeh 41025. Recorded in New York City, March 28, 1928. Considered the father of jazz violin, Joe Venuti pioneered the use of string instruments in jazz, with considerable help from childhood friend, guitarist Eddie Lang. The two of them met in their school orchestra’s violin section and would reconnect in 1925 while they were both pursuing gigs in dance bands and broadway orchestra pits. Only now Lang, having changed his name from Salvatore Massaro, had also changed his primary instrument to that of guitar. None other than Django Reinhardt would later claim Lang as a big influence on his own playing, so changing things up clearly paid off. Joe and Eddie would soon play with such luminaries as Red Nichols, Bix Beiderbecke and Frankie Trumbauer, and by 1927 they were leading their own bands, including Joe Venuti’s Blue Four, which created the little number featured here. Venuti and Lang were featured in the 1930 film The King of Jazz, a two-strip technicolor variety show of myriad delights. Bing Crosby also appeared in the film, and Venuti and Lang contributed to this charming—and for its time, mostly un-racist—cartoon set “in deepest Africa.” Look for Mickey Mouse’s cousin Oswald the Rabbit at 2:22. Tragically, Lang died in 1933 from a botched tonsillectomy that resulted in an extreme loss of blood. Venuti continued to tour and was known for putting on a good show that highlighted his affinity for pranks, including playing cheap “stunt” violins to break over the heads of his fellow bandmembers. Venuti had a number of professional peaks and valleys, including studio gigs with Bing Crosby’s radio program and MGM films and long stretches of no work at all. He fought a long battle with alcoholism and came out the victor in time to see public interest in his music renewed in the late 60’s. He would go on to play at the 1968 Newport Jazz Festival, the 1969 London Jazz Expo, and record with a number of fellow luminaries, including Zoot Sims and Earl Hines. Joe Venuti died at the age of 74 in 1978.